James Beard Rising Star Chef semifinalist Beau Schooler was born and raised in Anchorage, Alaska, and began his cooking career at 14. After working at several restaurants throughout Alaska and in Portland, Oregon, he enrolled at the Italian Culinary Institute in Calabria, Italy, in 2006. 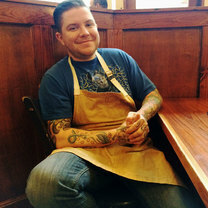 After completing his studies at the Italian Culinary Institute, Schooler made his home in Juneau, Alaska's capital city, where he owns and operates several eateries. "Nettle pesto, halibut, cherry tomatoes, cream cheese and pine nuts. Pizza special by @seamusmcbrien"
"@amalgadistillery gin poached beets, rosemary and lemon confit fennel, melancholia, lavender almonds, goat cheese." "Green, white, and pink peppercorn crusted brisket, king crab, fennel, horseradish, brown butter @redboatfishsauce cuvée vinaigrette"
"@takusalmon, ginger ale-oil, ginger green tomato compote"
"Hooligan boquerone, satanic eggs, leek"